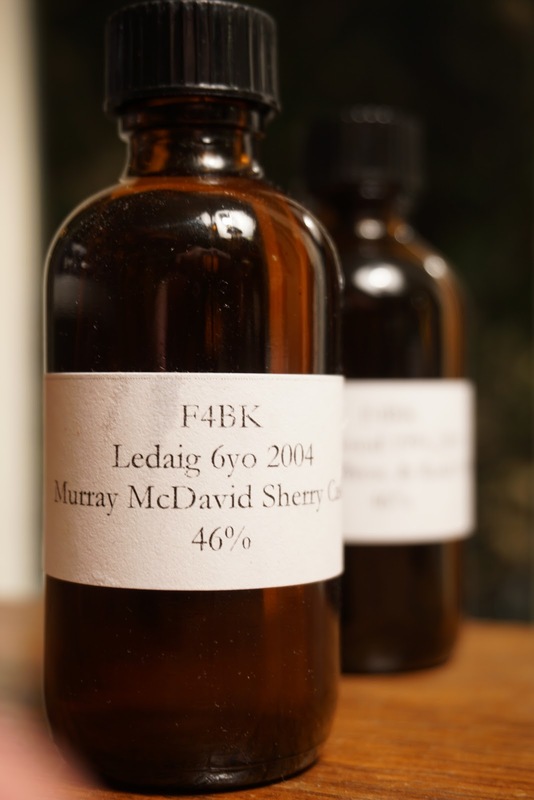 Murray McDavid Ledaig 6yo 2004 (46.0%): Next sample I grabbed from my desk is a 6 year old Ledaig distilled in 2004 aged entirely in an ex-sherry cask and bottled by Murray McDavid. Color: Honey, light amber with very thin but slow legs. Nose: Sticky and viscous peat and full on Oloroso sherry. Honey roasted nuts and sesame seeds. Burnt hay and plastic food containers. It gets sweeter in time: Tahini, strawberry jam and vanilla pod scrapings. Candied figs and gummi beards. Kinda young but stands firm against the hefty sherry influence. Palate: Very piney first... Pine cones, rosemary and pine sap. It opens up and add layers after allowing it air for a bit. Roasted chestnuts, almonds and grilled vegetables. Green banana peppers and dried strawberries. Mulberry juice and blueberry jam. Finish: Long with white pepper, hot banana peppers and bitter greens.